Aan de overkant van het zwembad en uitzicht op zee. Volledig uitgerust. Gelicentieerd als "accommodatie" door de gemeenteraad van Albufeira en het Toerisme van Portugal (licentie No. 40917 / AL). Om veiligheidsredenen, alle apparatuur zijn elektrisch. Het beschikt over airconditioning en een satelliet-tv. Parkeerplaats voor 2 auto's op parkeerplaats. Restaurants, supermarkt, apotheek, postkantoor, banken, enz. te voet, zodat het niet nodig om de auto. Thanks. I’m glad that you enjoyed your stay! 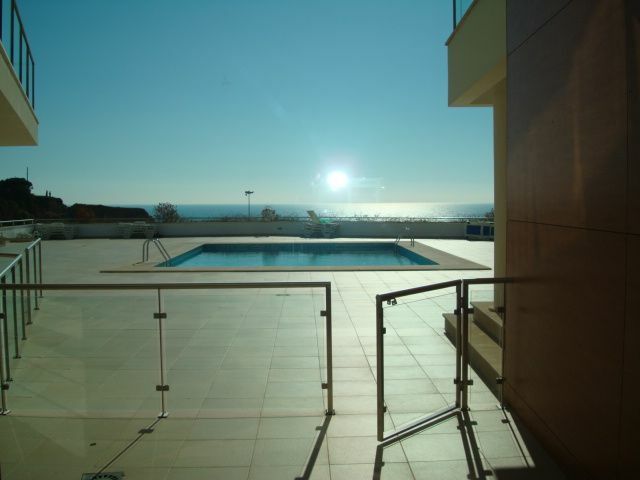 We had a lovely stay at this apartment, which was in a superb location for visiting the Algarve. It was our first visit to this part of Portugal and as a base it was convenient for exploring the area. It was away from all the large towns but also large enough to have all the amenities that you would wish for. The apartment was great, the only problem we had during our stay was that the heating was broken and we were informed that they were waiting for parts for the repair. In February the evenings were a bit chilly but we managed to solve this by having the oven on instead and an extra duvet on the bed. I can highly recommend this property. Thank you very much for your comment about your stay. I´m glad you´ve enjoyed it. Thank you also for your understanding about the air conditioner malfunction, the repair parts took 2 weeks to arrive and I felt powerless to solve this in time for your stay. Your creativity made it! Limpo, agradável, confortável e próximo da praia. Obrigada pelo seu comentário. Ainda bem que gostou. Até uma próxima oportunidade! Apartamento superou as nossas expectativas!!! Apartamento superou as expectativas!!! Acesso à piscina não podia ser melhor! Para quem tem crianças é ideal... muito próximo da praia com acesso de elevador... era isto que procurávamos... vamos repetir a experiência com toda a certeza! Obrigada pelo seu comentário. Ainda bem que gostaram e serão muito benvindos quando quiserem voltar! Ideal for a quiet holiday given the pool deck elevation but very close to the centre of the village and beach. Relaxing with plenty of space inside and out. Ideaal gebied voor een familievakantie in het laagseizoen heeft een rustige omgeving, midden en hoog seizoen heeft animatie en traditionele feesten. Ogen water houdt de kern van het oorspronkelijke vissersdorp. Volgende (lopen) restaurants (sommige met afhaalmaaltijden), supermarkten, winkels, apotheken, postkantoor, bank. Vergeet niet te kijken naar de 'ogen van water' (zoet) op het strand, naast de branding.